See this in Heathered fabric or with a Teddy lining. Runs very small I’m five feet tall and usually an XS. I expected it to be fitted but the arms were short and it was tight. Go up one size from your normal. I love this jacket, it’s so light, comfy and still keeps me warm. It’s also true to it’s size which is great and fits slim. 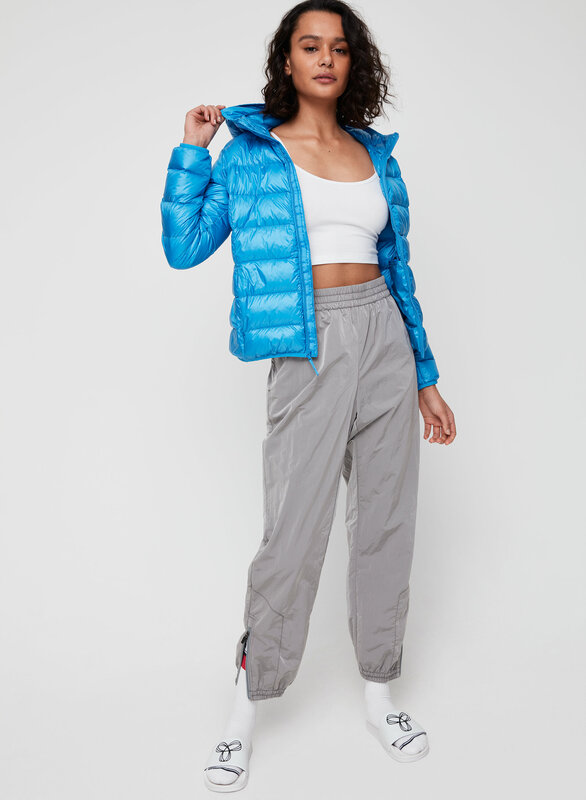 Definitely size up a size in this jacket. Really cute overall. 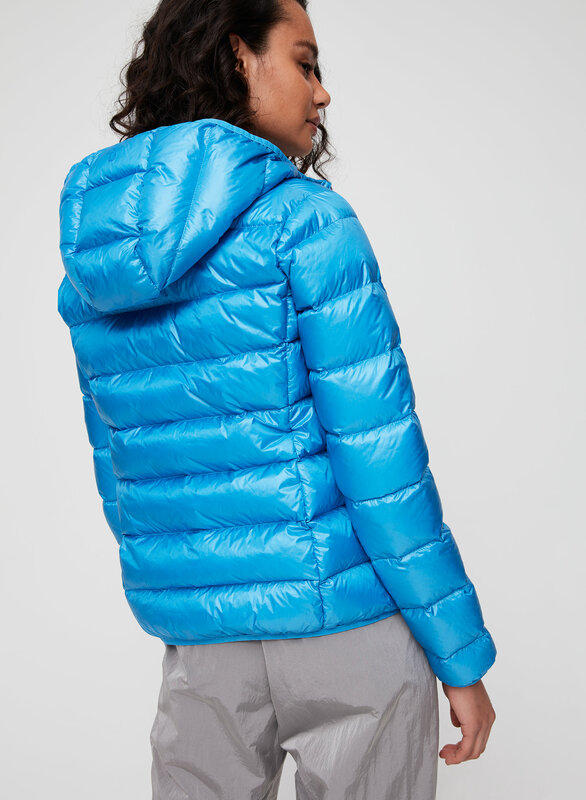 This jacket fits true to size and keeps you warm on mild winter days. Looks really cute too. 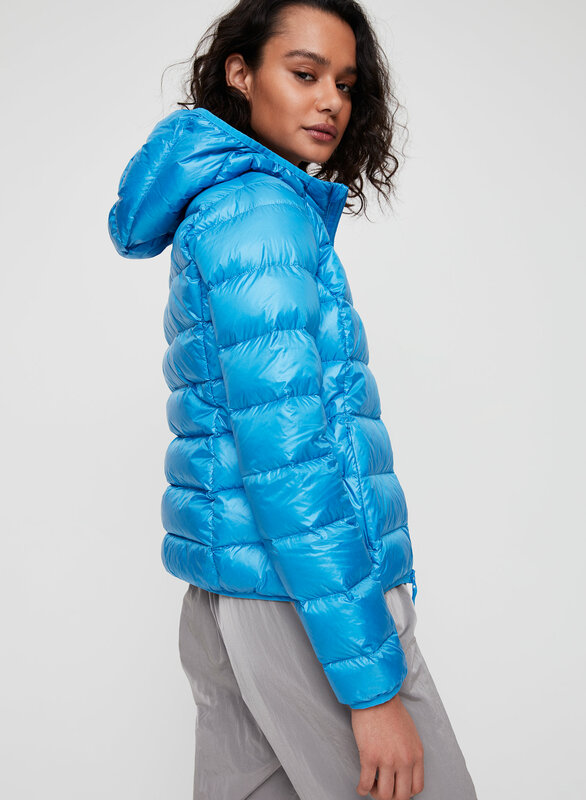 I love this puffer! 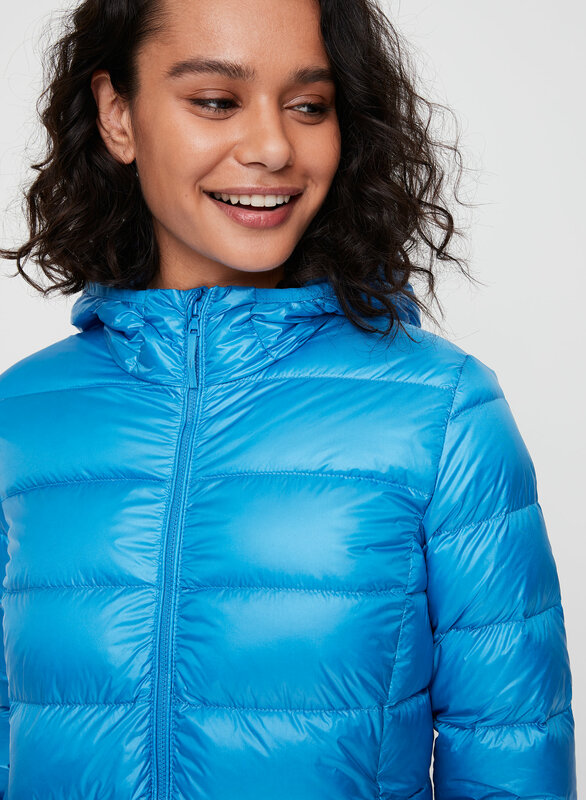 It is super light and thin but keeps me from getting cold in the winter. Fits smaller than normal especially across the chest. I have a smaller bust/chest size and this jacket was right in my normal size which never happens so I had to size up. love it other than that! 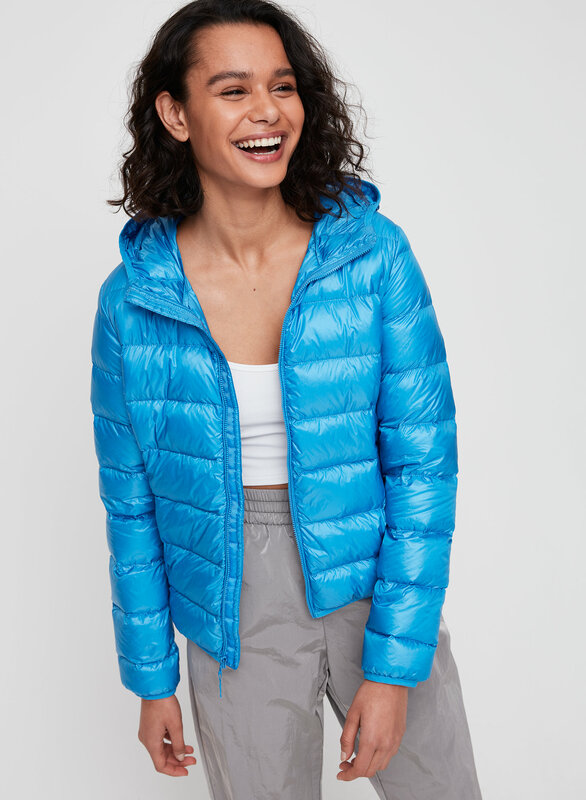 Loving my cute, light, puffy bomber. I think it'll make a great ski coat and city coat too. I am usually an XS, but to make room for layers I chose a S.
I live in Austin, TX so this jacket has been getting a lot of use for this Texas winter! Perfect layer. Will be great to wear skiing, too! Size up if you plan to wear a sweater under it. 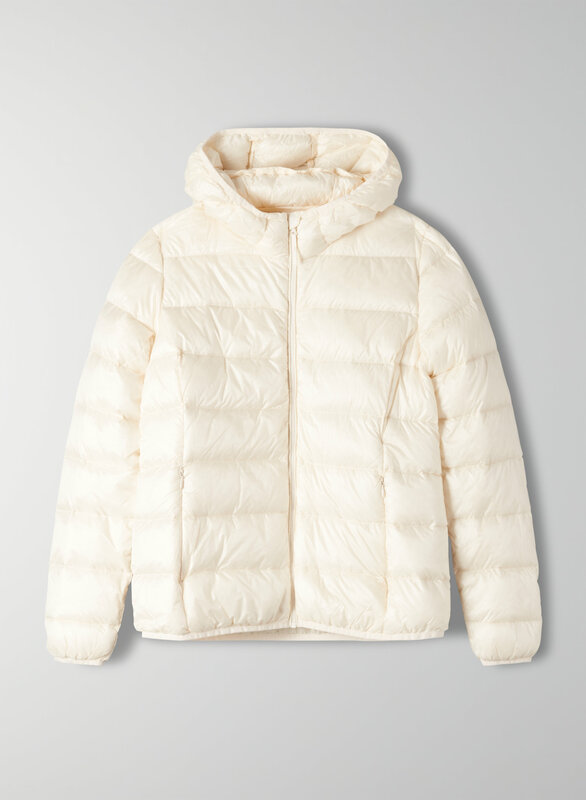 It’s the perfect little jacket, great for layering. You can dress it up or dress it down. It’s warm and very comfortable! wish you rolled over the hem on the sleeve to not expose that binding used on the cuff. Also, the feathers are coming through the shell fabric. Moreover, it could use my contrast on the logo and like 4 more inches on the body length. Purchased a XS - size up from my true size - and can comfortbly wear sweatershirts underneath. Fantastic for traveling or running errands. Go to piece, definitely a staple for transition seasons or layering. Love the color and the hood. It lacks the shape of the longer “Bravura” jacket. I would give it 5 stars if it had a two way zipper like the longer jacket. Fits well under my backpack not too bulky. Great for packing in a suitcase for travel just incase. I sized up so sweaters would fit under it better. It isvery warm and the colors in the pictures ring true in person. Super cute and warm I get compliments on this coat all the time! It doesn’t seem super durable so I’m paranoid about damaging it. For the price it’s a great little coat. I was so pleasantly surprised by everything about this jacket! It is the most beautiful and flattering shade of pink, it fits so well, is warm, and succeeds in making my figure look great - not like a marshmallow at all. Kept me surprisingly warm and dry through some heavy rain. Looks really nice on! It was a little bit thinner and shorter than expected but I still liked the silhouette. It was so versatile when it comes to traveling . It was so light weight , easy to pack and protected me from the weather in Oslo Norway . I love it !!! Very Light, not heavy. Perfect with layers underneath and perfect for in-between fall and not too cold winter weather.